Koray Aldemir min-raises to 100,000. Mateos calls. The flop is . Mateos checks. Aldemir bets 210,000. Mateos check-raises to 625,000. Aldemir calls. The turn is the . 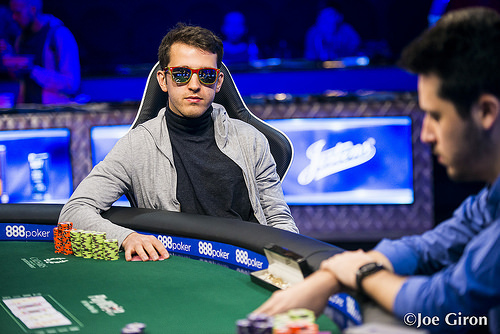 Mateos pushes Aldemir to an all-in choice for Koray's last 1,925,000, and he calls. Mateos holds for a flush draw and an overcard to Aldemir's . The river is a and Aldemir doubles up.